Why complain about the excellence of the Tide, Tigers? Swinney has built a program into top 2 status. Over here, you have dominance. Over there, same thing. Over here, you have great players and a great coach and a great program. Over there, ditto. Over here, you have Heismans and national titles. Over there, well, you get the idea. In some corners, there are those who look at this continuing rivalry between the University of Alabama and Clemson as a bad thing. Why, how dare they be great again? Isn't it someone else's turn? And that's the thing. Sports aren't about taking turns like an old Three Stooges movie where they invite each other to enter the doorway first. It's about excellence. And no one has come close to matching Alabama or Clemson in that lately. What? Would you be more comfortable watching the three-time losers of Georgia play against the overmatched Notre Dame Fightiing Irish? Would you want to see Oklahoma and that leaky defense play against Ohio State and that leaky defense? Would you rush to your set faster if it was Washington and LSU? No, you wouldn't. A lot of the complainers just seem to want to have something to gripe about. It was Sunday, less than 24 hours since the matchup was officially decided, and another guy in the press box announced that upper level seats for the national title game were selling for $11, or under face value. He promptly declared that America was weary of the matchup. Well, maybe some people are. But doesn't the geography of it all have something to do with it. A year ago, the teams played in Atlanta, an average of 136 miles from the campuses, and people couldn't get enough of the matchup. The average ticket went for $1,752. This year, the game is an average of 2,428 miles, which is a long way to go (the farthest ever) for a game that will be free on TV. I wouldn't go, either. Frankly, it's a pronouncement I've been making for years, since back when Venus and Serena Williams were playing in major finals throughout the year. Some people were bored with that series, too. Again, excellence is excellence, and neither side should have to apologize for it. If Alabama and Clemson are the class of college football, well, blame the rest of college football. Get better, or get out of the way. Look, do you have a problem that Batman still fights the Joker a lot of the time? Did you get bored by the seventh Lincoln-Douglas debate? Do you wish Al Capone had lost in the semis so Elliott Ness could beat someone new? The Celtics played the Lakers 12 times in the NBA finals. The Yankees played the Dodgers in 11 World Series. In post-season hockekly, Montreal has played Boston in 34 series, including seven finals. The play Hamlet has been performed a million times, and every time, he stabs Claudius. You get it. Being good often has an accompanying act. Nicklaus had Palmer. Evert had Navratilova. Nancy had Tonya. Sometimes, it's the best vs. the second best. Sometimes, it's the hero vs. the villain. Sometimes, it's smart and reasonable vs. just plain crazy. This time, it's Alabama vs. Clemson. Granted, a couple of things bug me about Alabama. They play three soft touches a year, which is one more than most major programs. Clemson plays in a weak ACC. I get it. But the ACC is weak for other teams, too. And other SEC teams play three layups a year, too. Look, did you gripe when the Steelers kept meeting Dallas in the Super Bowl? No, because they were the two best teams. When you look back on these four meetings between Alabama and Clemson (and counting), you may think of the same thing. Does it seem a little familiar. Sure, but so did Bond vs. Blofield. You'll get over it. Look…these two powerhouse schools are going to be at the top for a bit longer. Alabama is going to lose at least a dozen players to the NFL. But it has signed some of the best high school players in the country to replace them. And Clemson has a similar situation! It is the classic case of “the rich getting richer”. What young player would turn down Alabama or Clemson? So we can look for these two programs to be around for a while in National Championship contests. No complaints from me. I like to watch matchups of talent like this regardless of what scool is playing. I think both of these teams will be in the top five for a while. But there are others who can challenge. The season is a toe-stumping time. Ohio State had its controversy, Oklahoma had its defense, Georgia wasn’t quite good enough. 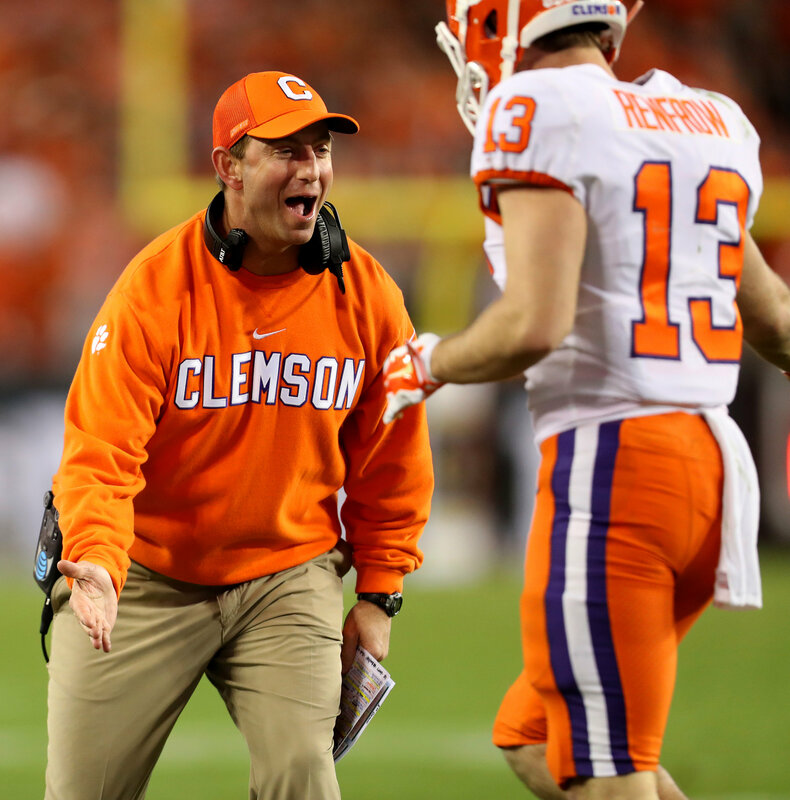 Next post: Ask Gary: Will Clemson-Alabama rivalry live on?